Soil erosion leads to soil loss and affects the hydraulic and mechanical properties of soils, and as a result, the soil fertility, eco-environmental quality, and reliability of engineering facilities will decline. Thus, it is very significant to study the mechanisms of subsurface erosion of granitic under different natural environmental conditions. However, limited studies focus on the effects of combined erosion angles and flow discharges on the subsurface erosion amount. 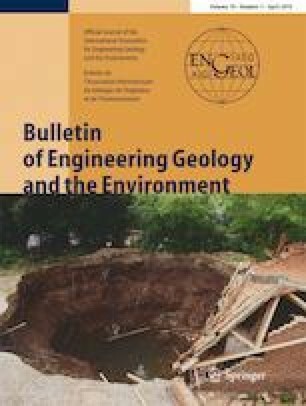 This study self-made a subsurface erosion simulator and designed a series of combinational conditions of different soil column angles (0°, 30°, 60°) and different flow discharges (25 l/h, 50 l/h, 100 l/h) to simulate the subsurface erosion phenomenon and processes of moisture migration within granitic collected from a collapsing erosion area in southern China. Results show that the subsurface erosion development in the soil column is a complex and progressive process with obvious preferential flow, which indicates the transportability of soil particles, and the processes of soil subsurface erosion change markedly along with the change of soil column angle and flow discharge. Moreover, the growth rates of wetting front and subsurface erosion amount will speed up along with the increase of soil column angle of flow discharge. The relations between the advance rate of wetting front and time since the beginning of the test demonstrate bilinear. The erosion amount has obvious fluctuation during the process of subsurface erosion in granitic due to fine particles erosion, reposition, pore clogging, and flushing. This research is funded by the National Natural Science Foundation of China (No. 51468041 and No. 41807285), the Science Foundation of Jiangxi Provincial Education Department (Grant: GJJ170666), the Natural Foundation of Jiangxi Province (No.20161BAB203078), and the Science Foundation of Jiangxi Science and Technology Normal University (No. 2017BSQD010).